The 2QD is a simple 2 quadrant (drive and regen braking) controller. This page describes how to build it and points to other resources that are likely to be helpful. The page is, initially, released in a partially completed form. so ask (via the list please) if you want more info. PCB component layout, with copper (view through PCB, from component side. PCB copper layout can me made available, as can bare circuit boards. Vey few components need special mention - almost all are very standard, with no cautions needed. But take note of the following points. The LM339 has a nasty habit of being susceptible negative spikes on its inputs: that is the function of the diode between pin 10 and earth (that's standard practise on LM339s, where such spikes are anticipated). However, experience has shown that certain makes of LM339 are far more sensitive than others and with some makes, the diode does not do the job. We have found problems with GS339 (GoldStar) and MC339 (Motorola) so avoid these manufacturers. We have never had such problems with ST or National devices. When they are switching, MOSFET gates can take a high current, so we use driver type transistors. In fact the effect of using standard ones is to slightly increase the switching times: this is not injurious and its effect on performance is barely noticeable. These are not critical. PNP types are BC557C and NPN types are BC546C. These have base in the centre. Beware of using 2N types: these are backwards compared with BC types, having the flat on the other side of the package. The parts list specifies BUZ100S. However the current limit values restrict the voltage across the MOSFET to around 0.7v. Multiply the Rds(on) by the continuous current rating of the MOSFET and you will find the voltage you get is below 0.7v for most MOSFETs. So you can really use any type of MOSFETs! These, ideally should be of the subminiature CR16 size. The reason for this is that when MOSFETs fail, they often put the supply voltage back onto the gate. Under this fault, the drivers will probably fail short circuit. A standard (CR25 size) 10R is likely to get hot - hot enough to burn a hole in the board. Although CR16s are not guaranteed 'fusible' experience shows that they almost always simply fail open circuit, without causing a fire or a charred hole in the board! This is a fairly critical component: it must be the plug-in type, with formed leads - the type shown in the drawing. You may get away with other sorts, but this type of application pushes the capacitors hard and these plug-in capacitors have thicker leads than the smaller, wire ended types. In a motor controller, a substantial proportion of the capacitor heating is actually in the leads which consequently need to be as thick and as short as possible. It is a noteworthy fact that capacitor leads are all nowadays made of steel, copper coated. But steel is a very bad conductor, both of heat and electricity. This is optional: the 'standard' is to use a 47K fixed resistor. Use a 47K preset in place of the 47K fixed resistor only if you wish to be able to reduce the current limit. The current limit is necessary to protect the MOSFETs so it is clearly not safe to increase it above the standard value, unless you know enough to work out safe new values. However, be warned that if you use MOSFETS of too low an Rds(on), you increase the work the main capacitor has to do. The main capacitor is the limiting factor on the current this type of layout will handle and the work the main capacitor has to do is dependant on a lot of factors (battery lead length and inductance, battery type, motor etc). A more powerful controller (e.g 4QD's Scoota controller) needs two main capacitors and there is also a lot more copper around the capacitor terminals to act as heatsinking. The board as designed is made for a Z shaped heatsink, as the drawing. However, it is easy enough to arrange other shapes of heatsink. The better the heatsink, the longer the controller will be able to give sustained high current. But, of course, the more heat you remove from the MOSFETs, the more likely it is that some other component will get overheated! This circuit and construction is relatively simple: if you overload the controller for too long, components will heat up until something gets hot enough to fail. However - you may be surprised at just how hot things can get! If you deliberately cook the board to death - you will probably melt the solder before anything actually fails! around the main capacitor terminals. around the source and drain lead of the MOSFETs, usually the drive MOSFET. around the power and motor terminals. There is no thermal shutdown included in the standard circuitry but it's not exactly difficult to fit. The obvious place to monitor temperature would seem to be the MOSFETs, but there is no room on the heatsink to easily mount a thermistor. And, as we have just seen, there are several places which may get hot! No point in monitoring the heatsink, if your system places most strain on the capacitor! Exactly which 'link' is the weakest depends on your installation - the layout, lead lengths and the mechanical loading on the motor, and the way you use the machine it's in. It's easy enough of course to reduce performance, so that all components are safe. But that will significantly reduce the performance! instruction manual in PDF format, from 4QD www site. 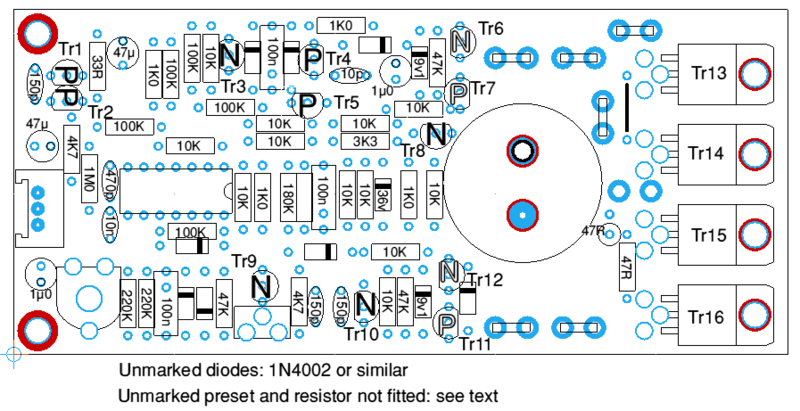 2QD Issue 8 circuit and description.